The Park Players announce their fall show: Angels in America. The New York production of this powerful drama won the Tony Award for Best Play, the Pulitzer Prize for Drama, and the Drama Desk Award for Outstanding Play. Players will present part one - Angels in America: Millennium Approaches which made its Broadway debut in 1993. In 2003, the play was adapted into an HBO miniseries staring Al Pacino and Meryl Streep. The current 2018 Broadway revival has been nominated for 11 Tony awards - the most ever for a play. 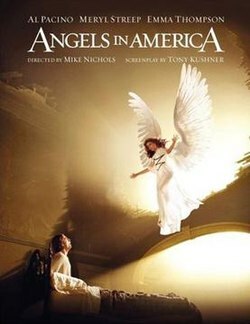 Angels in America is a symbolic examination of AIDS and homosexuality in America in the 1980’s. It follows fictional characters as well as some actual people such as Roy Cohn (attorney and mentor to the young Donald Trump) and Ethel Rosenberg (Communist spy). There are Mormons, a nun and a rabbi, ghosts and angels, a homeless woman and an Eskimo. There is a brief appearance from Aleksii Antedilluvianovich Prelaparianov, the World’s Oldest Living Bolshevik. Auditions for this many-charactered production will be held at the Redford Theatre on Lahser at Grand River on Thursday August 23 from 7-10 pm and Sunday, Aug. 26 from 1-5 pm. Rehearsals are typically on Tuesday and Thursday evenings, and Sunday afternoons. The performances will be on two weekends between November 9 and 18. Whether you have a great deal of theater background or have never ventured on to a stage, perhaps this fall is your time. There are numerous roles both large and small. For additional information, contact Archie.lynch2@gmail.com. Otherwise, please join us at the theater in November.